In association with; Oxford Scalextric Club, Pendle Slot Racing Club, Manx Slot Car Club, Demon Slot Club, Scale Models, Rockingham Slot Car Club, Farnham Scalextric Club, AEC and Wye Valley Slot Car Club, SlotRallyGB is proud to announch the 2014 SRGB Championship. 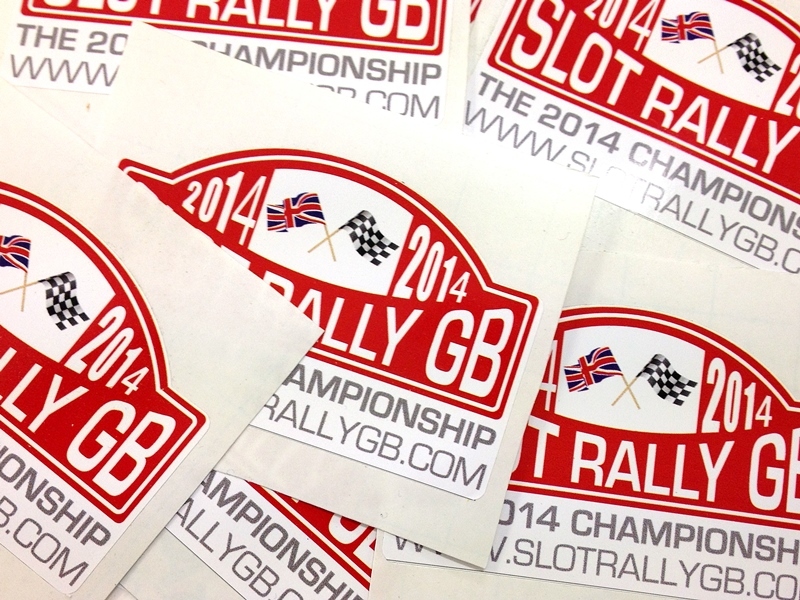 Now in its 5th year the SRGB Championship welcomes new sponsors and supports from the slotcar world and has introduced some slight alterations to classes and rules for the 2014 season. For 2014 we will hold 9 individual/championship qualifying events and 1 non championship public event. Motor Heritage Centre, Gaydon, Warwick – 17th & 18th May 2014. Entry costs for the championship and for individual rounds has been kept the same for 2014 with Championship entry at £5 for the year and entry for events at £3 per car/event/entry. You enter the championship at the first round you attend and you will receive a SRGB 2014 membership card along with a sticker, there is no need to pre-register. All the events are announced in the events section on Slotforum.com and also on Facebook. Use Slotforum.com to register for each event. With support from our sponsors the prize pot for the championship will once again be substantial with slotcars, trophies and a few special prizes during the year (details to follow). You don’t have to compete at every event to take part so if you only fancy trying your hand at your local event that’s fine just sign up to the event of your choice and come along – we can’t guarantee you will not be bitten by the SRGB bug, but if you just fancy a fun day out playing with toy cars we look forward to seeing you. We try to make the championship as fun as possible you can take it as seriously (or not) as you wish! There is a class for any type of slot rally car so as long as the magnet has been removed you can bring what you have, plenty of regulars are on hand to help, advise and encourage. There are rules and they can look a little daunting and complicated at first, but most are common sense or designed to offer a level playing field to everyone of all skills, ability and budget. A separate topic will be opened to discuss the rules and regs so if you have questions just ask. This is for RTR slot car models of Rally cars rallied prior to 1980. This is for RTR slot car models of Rally Cars rallied from 1980 – 1989. This is for slot car 2 wheel drive RTR models of Rally Cars rallied from 1989 typically from the IRC, JWRC, S1600, IRC. This is for RTR slot car models of 4×4 (4 wheel drive) Rally Cars rallied from 1989 onwards typically, but not exclusively, from the WRC & IRC. This is for slot rally cars that do not run in any other class and also includes Scratch built cars which will qualify for a special “Derek Cooper Challenge” Cup/Award/Prize. This is a one make – Scalextric/Hornby Production class for a specific list of Scalextric Rally cars. Link to Slotforum topic with the rules and regs. 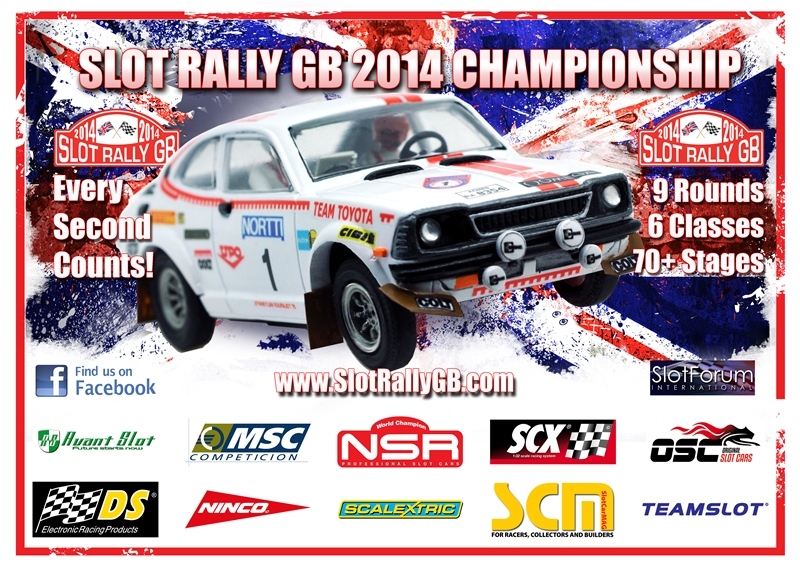 Once again SRGB will be issuing a limited edition slot rally car in 2014, previous models have been supplied by Teamslot and SRGB and include Lancia Stratos, Lancia Delta, Skoda Fabia S2000 and Toyota Corolla. For 2014 we will be issuing a Toyota Celica 1600GT from the 70’s – details to follow.